Ex-world cruiserweight champion Enzo Maccarinelli will face Denis Lebedev at the O2 Arena on 27 June, his first bout since leaving trainer Enzo Calzaghe. Moscow southpaw Lebedev, 29, has won all 17 of his fights, and the victor may be in line for a world title shot. Swansea's Maccarinelli, now trained by Karl Ince, knows this could be his last shot at glory at 28-years-old and with two defeats in his last three fights. "I've been a world champion before and I want to be one again," he said. "This is a great chance for me to prove myself against an undefeated fighter, and I can't wait for 27 June. 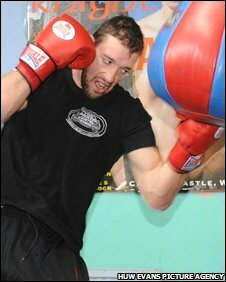 Can Maccarinelli return to glory? "Working with [Preston's] Karl Ince has been fantastic and I've got my hunger back. "I'm going to knock out Lebedev and then I'm going after [Ola] Afolabi for a rematch." The bout, for the vacant WBO intercontinental cruiserweight title, will be on the undercard of Amir Khan's WBA light-welterweight title challenge against Andreas Kotelnik. Maccarinelli's last appearance at the O2 Arena was in March 2008 when he suffered a second-round knock-out in a cruiserweight unification clash with David Haye. He stopped heavyweight Matthew Ellis in two rounds at London's ExCeL Arena last December, before the shock ninth-round knock-out to Afolabi in March, his third defeat in 32 fights. Now Lebedev - who, like his opponent, is promoted by Frank Warren - is out to shatter Maccarinelli's dream of becoming the first Welshman to regain a world title. "I've seen Maccarinelli's fights and he is a good boxer," said the Russian, who is untested at the highest level. "I know that he wasn't himself against Afolabi, and I have to prepare for a world-class opponent. "But I am so confident of winning this fight. Last time out I boxed a very dangerous puncher in Eliseo Castillo and I stopped him in five rounds, and I believe that I will do the same against Maccarinelli. "Ever since I was a little boy I have wanted to be a world champion, and I am just a couple of fights away from fulfilling my dream." Warren added: "This is a real crossroads fight for both men, and I know they are going to come out and give it their all because there is so much on the line. "I'm confident that whoever wins will find themselves fighting for a world title before too long."